The longer you take to pay off your home, the more you are going to pay. There are many strategies to reduce your loan, but most of them come down to one thing: Pay your loan off as fast as you can. For example, if your loan amount is $300,000 at 5.46% per cent for 25 years, your monthly repayment will be about $1,835. This equates to a total repayment of around $550,500 over the 25 year term of your loan and the total interest paid would be approximately $250,000 (nearly as much as your initial amount borrowed). If you pay the loan out over 10 years rather than 25, your monthly payment will be $3,250 a month (ouch!) But the total amount you will repay over the term of the loan will be only $390,000 – saving you a whopping $160,500. * Call us to help you calculate how quickly you might be able to pay off your home loan. Most people are aware that if you pay your home loan fortnightly instead of monthly you can make a huge impact on repaying your loan. Simply divide your monthly payment in two and then pay fortnightly instead of monthly. It will make thousands of dollars difference in your total repayments and cut years off your loan. Most people don’t even notice the difference. The reason this works is because there are 26 fortnights in a year and only 12 months. 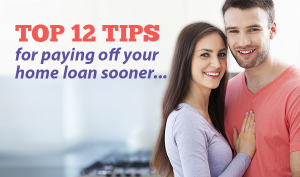 Making payments on a fortnightly basis means that you will be making 13 monthly payments every year. You will be surprised at the difference it makes. Lenders will always calculate your serviceability at a few basis points higher than they offer you to protect themselves for when interest rates increase. This means they believe you can afford to pay more (usually 2%) than the mortgage they give you. So why not pay more immediately? If the interest on your loan is around 5.5%, then start paying it at 7.5%. When interest rates rise (and they will) you won’t even notice. This also means that you will be paying off your loan faster and saving a bucket in interest payments. *Call us if you would like us to calculate your repayment figure at 2% higher and to see how many years we can take off your loan. You will be paying between 15-25% interest on most of your personal debt (personal loans, credit cards, store cards etc). Many lenders will allow you to consolidate (refinance) all your debt into your home loan. This means that instead of paying those higher interest rates, you can transfer these debts to your home loan and pay only 5-6% interest. The trick and biggest advantage of consolidation is to keep paying the regular payments you had prior to the refinance. And cut up those credit cards! This will pay your debt and home loan off much sooner and save you tens of thousands of dollars in interest payments. Another advantage of consolidation is when interest rates rise. When your home loan interest rate starts to rise, you can absolutely guarantee that your personal loan and credit card rates will also rise. By consolidating your debt, this will protect you from higher personal interest rates and unaffordable debt. As always, any extra repayments or lump sum payments will benefit you in the long run. We all know that if we cut out our small indulgences and put this towards the loan, it all helps. However unless you do the numbers, you might not realise HOW MUCH difference this could make to paying off your loan sooner and saving bucket loads in interest payments. Once you obtain a mortgage, your life is likely to be luxury-free for a while, or at least pretty close to it. We know there are things we will have to give up, but not many actually work out the impact of giving up these small indulgences makes over the lifetime of your loan. For the sake of our health we should be giving up smoking and drinking less anyway. Let’s look at the example of how taking your lunch from home and having one less coffee per day will cut years and interest off your loan. If you spend about $12 per day on lunch and $4.50 twice a day on coffee, that’s $5,040 per year. If you cut that down to say $4 per day for lunch by preparing and taking it from home and purchase only 1 coffee each day, then you save $3,000 per year. Assuming a mortgage of $300,000 at 5.46% over 25 years, by making $250 in extra repayments each month, you’d save more than $62,000 in interest and be mortgage free 5 years and 5 months sooner. What else could you cut out? We are not saying you should scrimp on everything but just cutting down a little on your expenses will see you reap huge financial benefits. Sometimes one of the most simple solutions for paying off your home loan sooner is for us to help you change your finance type or structure. You may not even have to change lenders! As the industry becomes more competitive, lenders change their products and offerings quite frequently. Your lender will be the last one to tell you they have a better or more competitive product. However by using your finance specialist we keep abreast of all new offerings and can usually negotiate a better deal on your behalf. Before you try to do this yourself, we can often negotiate lower fees associated to changing loans. We help you work out if changing makes sense for you financially and strategically. * Why not test us out to see if we can find a more suitable loan for you? What do you have to lose? For example you may have a mortgage of $300,000 at 5.46% and a savings account with $50,000 earning 3%. By having the $50,000 in your offset account, it means that your loan is reduced to $250,000, the offset is accruing interest at 5.46 % (instead of 3%) and you are not paying tax on the income. Imagine how much this saves you over the lifetime of your loan! Plus your cash is on hand for whenever you need it without tying it up for 6 to 12 months at a time. investment is usually a safe strategy to start planning your financial future. The goal of this investment strategy is for the investment to help you pay down your home loan (non-tax deductable debt) more quickly while increasing your overall net worth through investing. We recommend you seek financial advice from a qualified finance specialist like ourselves before trying to figure it out for yourself. Don’t waste the opportunity by making mistakes. that you’ve got their money – so don’t worry too much. as little about it as possible. This attitude could be your biggest mistake. Rates change, bank offers change, and new products are introduced. Seize the opportunity and allow us to negotiate a better deal for you. Stay informed and ahead of the game by reading our updates and committing to regular finance reviews.